It’s well-intentioned. A lot of the oil-based skin care out there is not healthy for skin. Companies use petroleum-derived oils, or vegetable oils that will clog pores. No one wants that! But, it’s the wrong approach. Rather than vilifying all oils, we need to choose the right oils to have healthy skin care! Our skin isn’t hydrated by water — at least not topically! That water needs to go in your body to help you stay hydrated. We all know that if we’re not drinking enough, our skin tends to be drier and even appear more wrinkled. So drink up! But on the outside? What we really need is oil. Our skin produces its own oil, and that’s how it stays soft and supple. When there’s a breakdown in proper oil production, then we can see breakouts. The goal is to fix that improper oil production…and water just won’t cut it. Plus, adding water to skin care dilutes it, and causes you to pay more money for something that isn’t beneficial. Is Oil Really Going to Help My Skin…? It feels like adding extra oil to skin would cause breakouts. But that’s only if you add the wrong oils. We look at each oil in three different ways. Its comedogenic rating (how likely it is to clog pores), its fatty acid profile, and its benefits to skin. Every oil has a comedogenic rating from 0 – 5. A rating of 0 means it’s been shown to never clog pores. A rating of 5 means it almost always clogs pores. Some oils that have benefits to skin have a rating of 5. For example, wheat germ oil is really good at fighting scar tissue, but it is a 5, so we don’t use it in skin care. (It’s good for other parts of your body, though!) It’s important to choose oils that rate 0 – 2 whenever possible. Every oil also has a unique fatty acid profile. There are several different fatty acids — linoleic, oleic, stearic, palmitic, and more. Those first two are found in unsaturated/liquid oils, while the latter two are found in saturated/hard oils. Some skin types need more of one fatty acid than another. Most people don’t know this, so they don’t consider it when formulating. It’s why some products intended for acne-prone skin actually cause breakouts for some people! Finally, every oil has additional properties that make it beneficial to skin in certain ways. An oil may help fight acne, be deeply nourishing, help reduce redness, and more. In order for an oil to be truly beneficial to skin, it has to check all the boxes — have a low comedogenic rating, the right fatty acid profile, and the right overall skin benefits. That’s why our skin care works, when other natural skin care doesn’t! In our skin care line, we use only ingredients that are truly beneficial. It’s why so many people say it works for them, and doesn’t even have an “adjustment period” like many other options. Our cleansers are bar soaps, and there’s a good reason why! We use true soaps instead. Soaps which are super-fatted with nourishing oils to prevent dryness, but don’t have a lot of unnecessary stuff added that makes them more expensive. These soaps are gentle on your skin. They have a pH of around 9, which gently disrupts your skin’s acid mantle and breaks up oils and dirt to truly clean your skin. They’ll even remove makeup properly, with no need for a separate “makeup remover” product. A detergent-based cleanser just doesn’t work as well! Try the Charcoal Facial Bar if you have oily or acne-prone skin, and the 3-in-1 bar if you have dry or sensitive skin. As we mentioned above, yes, we use oils — and only oils — in our moisturizers! Some have been afraid to try them, thinking they would be too greasy or would cause breakouts. But they don’t! We formulated very carefully with oils that are beneficial to different skin types. Those with more oily skin, or who are acne-prone, will do best with our oily formulation. It’s rich in linoleic acid, which those with acne usually don’t have enough of. The fatty acids balance your skin’s natural oil production, which helps to reduce breakouts and keep pores clear. Those with drier skin who aren’t acne-prone will do better with our dry formula. It’s more balance in its fatty acid profile (between oleic and linoleic) and more nourishing. Of course, for those who are worried about redness, fine lines, wrinkles, acne scars, uneven skin tone, etc. — our Rejuvenate Me is perfect. It has two skin-healing oils plus deeply beneficial essential oils. It’s the only skin care product where we use essential oils, because we’re after the deeper-level benefits. We don’t use oils just for scent; it matters how they work! Consider our toner, too, which helps to balance oil production and close pores. Love the idea but aren’t ready to buy full-sized products? 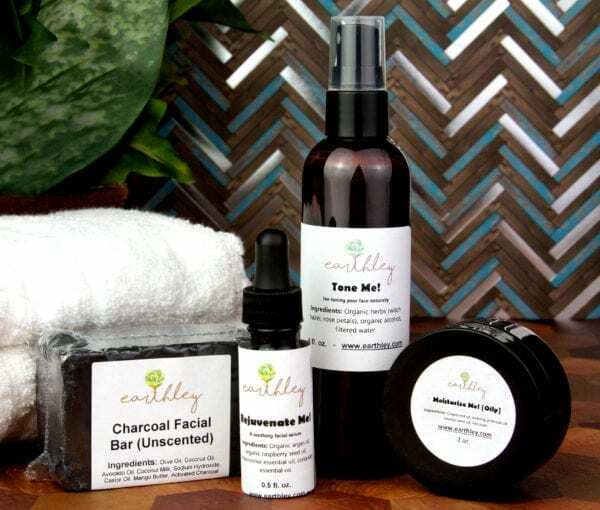 Our Skin Care Trial set is perfect! This affordable set will last at least a month with daily use — long enough to know if it’s really working for you. Still have questions? Email customercare@earthley.com or hit the Click to Chat!